RainStorm: a world of adventures: Let loose on the slopes! After three lessons featuring quite a bit of falling over and a very patient ski instructor, I've got myself signed off to ski by myself! This lesson was so much more fun than the previous two. 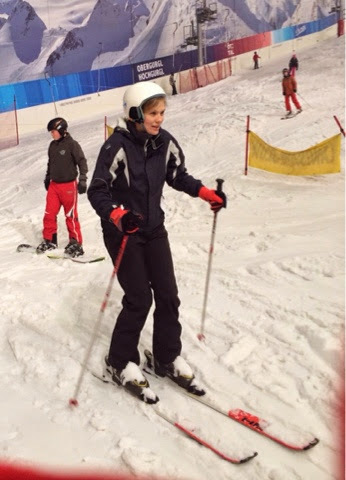 I took the bumps more naturally and even smiled whilst skiing (a new experience for me!). I also didn't take any tumbles although there were a few wobbly moments. Currently my skiing still resembles a zombie on ice. I'm much more relaxed than I was but am still too stiff; I have a tendency to look at my skis unless someone reminds me to look up; and generally I pootle down at a pace slightly faster than that of a tortoise. Anyways, I am celebrating and made the most of an hour on the slopes without my instructor. Yay! YAY! Love skiing although I haven't done it for several years. Good for you to get out there with some lessons. Thanks :) I am sooooo not a natural skier, but seem to be getting the hang of the basics at least. It is good fun!